I was in Florida and got stuck in a hail storm. When I returned to New York I asked around for estimates on repairing my 2004 Mustang convertible, I was referred to Dent Terminator, and I made an appointment. I was shocked and amazed how within 1/2 of a day my car was repaired back to its original condition! My car was damaged by hail and my insurance company referred me to Dent Terminator. I was impressed by the quality of his work, my car was fixed fast and I got to save the deductible! how within 1/2 of a day my car was repaired back to its original condition! repaired my hood while I was waiting, and the results were worth the hour long drive! I spoke to Francesco on the phone about the large dent on the aluminum hood of my 2005 S Class Benz, Although I was skeptical on whether or not my hood could be fixed I drove over an hour to meet Him. He repaired my hood while I was waiting, and the results were worth the hour long drive! So I went to see Him for an estimate. I couldn't believe the cost difference, and within 1 1/2 hours my hood was fixed. I saved both time and money. I had a large dent on the hood of my Volvo and when I priced around to different auto body centers, they told me my hood had to be replaced - it was about a $1,500.00 job. One body shop owner referred my to Dent Terminator, So I went to see Him for an estimate. I couldn't believe the cost difference, and within 1 1/2 hours my hood was fixed. I saved both time and money. I was very satisfied with the quality of his work. I highly recommended Dent Terminator to all my family and friends after I saw how great my car looked... I was very satisfied with the quality of his work. I heard about paintless dent repair, but I was skeptical. After I saw Francesco the Dent Terminator I was converted. Very happy ! Excellent result! I was told from my dealer that I had to clean up all dings and dents before returning it. They referred me to Francesco, the Dent Terminator! My car was repaired and I was satisfied with his service! 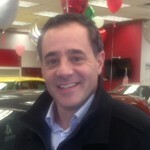 I am a car dealer and I am using Francesco for all dent work! I really recommend him!